The first thing one notices about this picture book for children 4 to 6 years is that it has peek-through pages, including on the hard cover where there are ten children of different colours and nationalities: two of them appear in the cover cut-out. As one opens and reads each page, another child appears and then another until all ten children are together again. 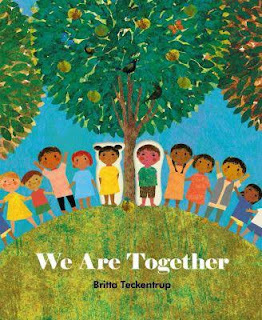 This reinforces the book’s theme that ‘on our own, we’re special… But when we join up… together we’re a team.’ In each of the richly illustrated pages, children can be seen outdoors in changing weather – cloudy skies where they fly kites, golden sunset, autumn winds and so forth. On every double-paged spread is a quatrain in rhyme. For instance, one says, ‘We may travel alone/free as birds in the sky, /But flocking together,/we soar and we fly. When there’s a storm, the verses say, the children can splash through puddles ‘till the sun shines again.’ Another page has the lines, ‘If we all sing together, one voice becomes a choir’. The whole book shows the power of being sociable and becoming part of ‘one big happy crowd!’ which is one supposes, the whole purpose of bringing children (people) together in our society so it will function happily. There are dozens of children shown – colourful and happy – in the bright fly pages both ends of the book, and on the final page. This would make a marvellous book for pre-school teachers to present to their students, and for parents trying to make their children function happily in the world.